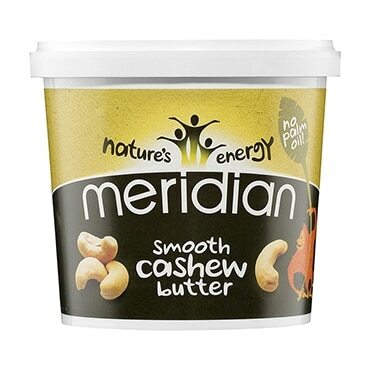 Meridian Smooth Cashew Nut Butter is made from quality ground, roasted cashews, with nothing added! This cashew butter is a good source protein and healthy fats. Give it a good stir before spreading on your favourite foods. Seriously tasty with porridge, and spread on rice cakes, oat cakes, or toast topped with banana. Why not try stirring it through hot pasta? Contains NutsPacked on the same line as Other Nuts, Sesame & PeanutsContains naturally occurring sugars. Meridian Smooth Cashew Butter is rated 4.6 out of 5 by 37. Rated 5 out of 5 by namrebo from Delicious Excellent. It was delivered by convenient nearby click and collect, very well wrapped and sealed tightly. There is an added 4% of sunflower oil but it seems to improve consistency. It seems to need less stirring than before. Rated 1 out of 5 by Katk from False advertising! I’ve been buying this for a couple of years now but my recent order shows it is no longer 100% cashew nuts! Why is it still being advertising here as such? Not impressed and probably won’t have the time to get it packed up and returned. Rated 2 out of 5 by Poppypup from Why the change This product should highlight the fact that the ingredients have changed as I am unable to tolerate sunflower oil, it is no wonder that I have been feeling unwell since starting a new tub. Rated 3 out of 5 by Veganista from Delicious and damaged Have bought before. This time it arrived damaged and leaking. Rated 4 out of 5 by Boxing from Cashew butter I have tried other brands of nut butters and in my opinion this is the best. Rated 4 out of 5 by Emilyjcfd from Delicious and great value I buy this cashew butter in the largest quantity as I bake with it often and it works out much more reasonably than buying the smaller jars.